distribution A northbound stray or migrant in most areas of the state, but almost certainly now a resident in the extreme southeastern counties, north to Carteret County. Widely scattered over the Coastal Plain, with a few Piedmont records, and two from Henderson County in the mountains. Greatly expanding its range northward; thus, the county map will likely become out-of-date very quickly. Primarily found along the southern coast, north somewhat regularly to Carteret County, but one must assume it is not a resident (yet) away from coastal counties, based on its very spotty range inland. abundance Increasing in recent years; probably rare 10 or 20 years ago. Now, it is generally uncommon in coastal counties northward to Carteret County. Very rare farther inland and northward. Our peak single-day count is just nine individuals, though this number should be surpassed in the next few years. flight Mid-June to late November, but mostly from mid-August to mid-October. These dates suggest a fall migrant species, moving north after breeding farther to our south. However, there are likely a few sites along and near the coast where it is a resident. habitat Generally at ponds, marshes, and lakes. Despite it being seen mainly near the coast, most breeding waters are probably fresh, though it does use brackish waters. behavior Males are very conspicuous as they perch on twigs at their pools or ponds; they are quite active and do much chasing and patrolling. Adults will often feed well away from pools, as do most other skimmers. 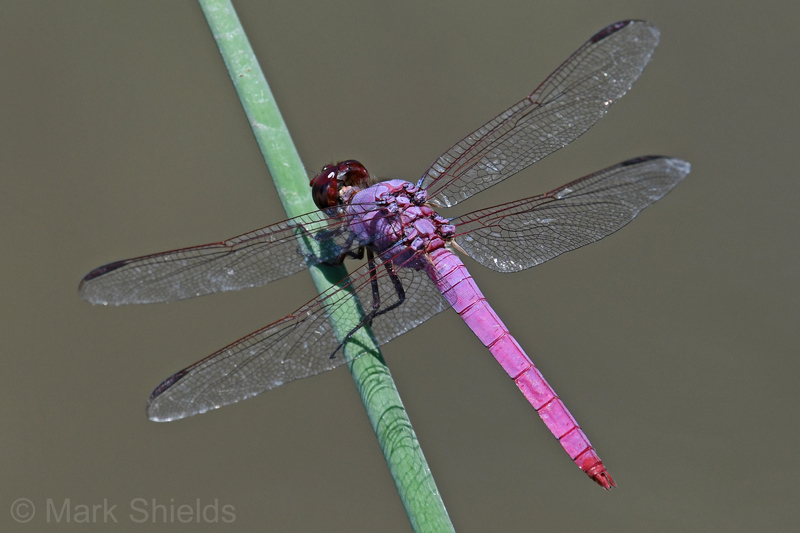 comments The deep rose-pink color of the male's abdomen is not often seen in the animal kingdom, even in birds or butterflies, and is more reminiscent of the rosy color of the petals of many wildflowers! This species is currently undergoing a rapid northward expansion in the range and in numbers. It is not hard to find at various places around Wilmington, such as near gardens and other suburban places. But questions remain, especially regarding residency status in NC away from the southern coast. It was dropped as a Watch List species by the NC Natural Heritage Program in fall 2010. Comment: Carteret, 2003-08-16, FOMA - female on soundside service road.